Recently I was delighted to re-visit the skills I learned back in design school in order to create custom ombré-dyed curtains as a birthday gift for my sister, who was redecorating the master bedroom in her brand-new house. Her inspiration theme was "seaside beach-house." Thanks to the wonderful folks at Dharma Trading Company (my favorite dye supplier), and 10 yards of cotton voile and 2 ounces of powdered dye later, I was able to give her an extra-special-custom set of beautiful curtains just perfect for picking up that coastal breeze. For those of you who are curious about the process, see the pics below! 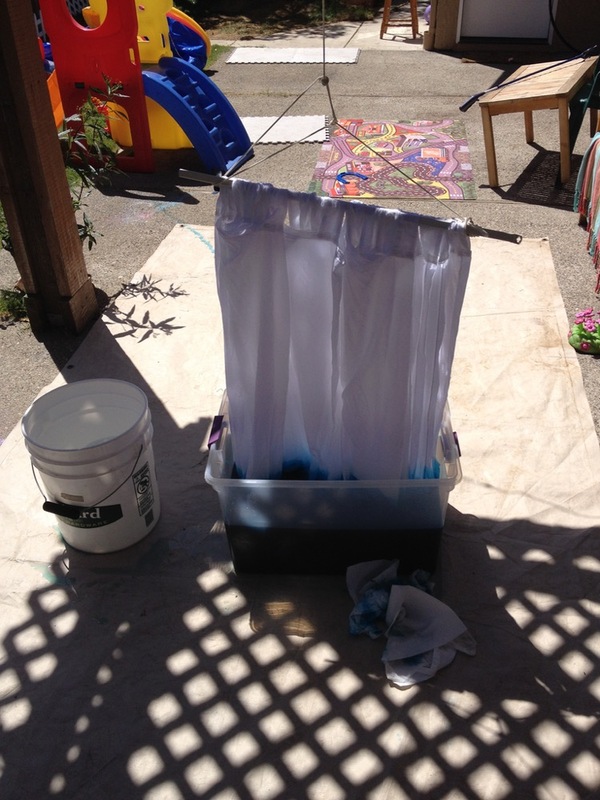 Start with an enormous container for the dye (like this storage bin, or a trash can), and something high up that is sturdy enough to hang yards and yards of wet fabric from. My sister had the perfect pergola over her back patio. Between the legs of a folding ladder also works. Also note, the curtains were pre-sewn. Going from the bottom up, you need to start with the most concentrated dye / least amount of water for the first dye phase. It's pretty scientific - know the volume of your container, and plan out how much distance you'll drop the fabric in each step. The trick to a smooth color gradation is timing. For these, I did three minutes per step, and I jiggled the rope a little bit to try and avoid a hard line between steps. 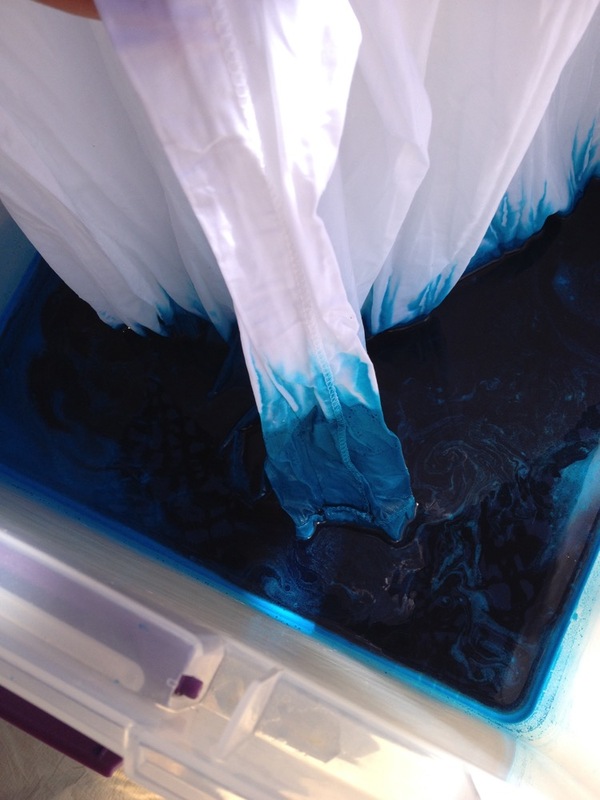 Add a gallon of water, gently mix, drop the fabric three inches, wait three minutes. Repeat. Be very careful when pouring the water to minimize drips. Step 5 - nearly there! This is the part that got a little nerve-wracking, because the dye wasn't diluting as fast as I wanted it to, and I was running out of fabric. I sped up the dilution a bit by removing a gallon of dye before replacing it with clean water. At the very end, I just took the plunge (literally), and dropped the last couple of inches in for just a split second before lifting the whole thing out again. Step 6 - wrap it up! Literally! Plastic wrap is a great way to prevent the dark part of the fabric to bleed off on the light part during the next phase - steam-setting! See? All wrapped up, no bleeds! Yup, in a microwave! It's a little trickier to ensure that the fabric gets thoroughly steamed without drying out (and then scorching! ), but it's a great way to avoid having to get a giant steamer if you only dye once in a while (like me). And rinse, and rinse, and rinse. Be careful to keep the dark part away from the very lightest part, because what is rinsing out is un-steamed dye, and it could transfer color where you don't want it to. Step 9 - hang dry! I usually like to hang dry hand-dyed items, because I never quite trust that I rinsed out all the raw un-set dye. Especially in a drought when I'm trying to be water-conscious! Step 10 - admire your hard work!